The last few weeks in Israel the mood has undoubtedly changed. Since the IDF launched its ground operation in Gaza 32 soldiers have been killed in action. 32 individuals who gave the ultimate sacrifice for the state of Israel, 32 future families around a Shabbat table, 32 friends, brothers and fathers who will know longer grace this world with their presence. Everyone is feeling the grief and there is definitely a somber mood in the air. Streets and bars which are usually full are increasingly empty, work places are suffering a lack of business and also a lack of employees as many of them were called up for reserve duty to defend the State of Israel. Last night I made the decision that I would answer the calls of numerous people to ensure that Max Steinberg's funeral was well attended, to ensure that this 'lone' soldier was definitely not alone in his death and that his family who travelled from America felt the loving support of Israel which becomes ever clearer whenever the security of our state is threatened. I didn't know Max, but after hearing a number of obituaries on him at his funeral I feel that I do. Steinberg who made aliyah from America made the decision to pick up shop and leave everything he knew back home in order to defend the state of Israel. Following his birthright trip he fell in love with this land and upon his return set the ball in motion, planned his return to Israel and his enlistment into the IDF. Max was just a normal American kid who played baseball, football and soccer, he enjoyed listening to Bob Marley, a recurrent theme throughout his eulogies. Given that he made the same move I am currently making I know that had I of met him we would have instantly shared a common bond. Our shared desire to serve and protect the state of Israel and put our lives on the line to fight for Israel's right to exist. Max like many other lone soldiers before hand, (Michael Levin in particular) pushed hard for what he wanted. He knew that he wanted to be in the Golani Infantry brigade but when told his Hebrew was not good enough for such a unit he defied time and time again even stating that if he wasn't to get into Golani, "It would be jail, or home". Eventually, his persistence payed off and he got into the elite Golani 13 Infantry Brigade. The pride he felt at that moment will be the same pride I hope to experience in the next coming months, when I hope I receive a combat profile and get into a combat unit. His drive and persistence saw him all the way through his combat training where he was awarded a number of certificates for being a stand out soldier within his unit. Max was already proving to his brothers in arms the commitment he would eventually show on the battlefield, the same commitment that would end up costing him his life. Hearing Max's parents speak I learnt that he had called them on July 19th at 4 am in the morning. He informed them that he had already been into Gaza and that a tank he was in had collided with another. Him and a number of other people from his unit had suffered injuries, some more severe than others. Max required medical attention but told his parents that although he was sore, "He had to get back to the action and get back to his friends". This was Max's last selfless act before he was killed in action. His determination and drive to serve and protect sent him straight back into the field with an injury in order to help his fellow soldiers continue in the war effort. His return to the front killed him. Max's death was not in vain, he died to ensure that the people of Israel can live free, free of terror, free of rockets, free of terrorists and free of tunnels buried under our homes. MK (Member of Knesset) Dov Lipman, summed this sentiment up beautifully in his eulogy to Max. He stated, "Your son is a Jewish and Israeli hero" - firstly he saved lives, he saved the lives of millions of Israelis under threat and secondly, "he was a newly found hero of hundreds of thousands of young Israelis and millions of Jews around the world, causing young people to refocus on what is important in life". He turned to the parents and siblings of Max and told them to look around, "tens of thousands of people have come in their masses to pay respect to their new hero. Max has helped rekindle the zionist spirit which helped give birth to this state". I don't believe there is any better way to put it than that. Max is a hero, I hear from friends that when in the army, serving alongside Israelis, often the lone soldier in the unit helps them to understand the importance of this state, to remind them that zionism is alive and that there is a reason to protect this country. 30,000 people attended Max's funeral, the vast majority had never met him and now never will but it still stands - he will be engrained in all our memories forever. I will think of him when I become a soldier as I will think of others like Michael Levin whose stories touched me and meant something to me. Whilst I stood amongst the graves of hundreds of other soldiers who had given their lives for the State of Israel, I felt it important to look at the graves right next to me and to remember those fallen soldiers as well. It just so happened that the one grave next to me was that of Roi Klein. To many people his name probably means nothing but I remembered reading his incredible story and realised that I was surrounded by heroes, each one of them taken too soon, each one of them with their own story, their own future which they never got to play out. Roi Klein died in the 2006 Lebanon War when a grenade landed near his unit, without any hesitation he jumped on the grenade reciting 'Shema Yisrael' and shouting "long live Israel". In this selfless and heroic act he saved everyone else in his unit by taking the full blast of the grenade, all a day before his 31st birthday. I think this story shows the difference between an Israeli as a human shield and Hamas' version. In Israel photos are appearing all the time of Israelis protecting and shielding babies during sirens, becoming human shields to protect someone more vulnerable whilst in Gaza people are complying with Hamas' command to run onto buildings or to accept that rockets are fired from within hospitals, schools and mosques. This dichotomy between our people, and theirs, sums up the situation here. Israel breeds heroes, Israel preaches love and life whilst our enemies call for our deaths and their citizens deaths. All I know is, it is our strength, our love of life, our heroes like Max, like Roi, like Michael and the thousands of other soldiers still fighting for us today that will ensure our continuity. 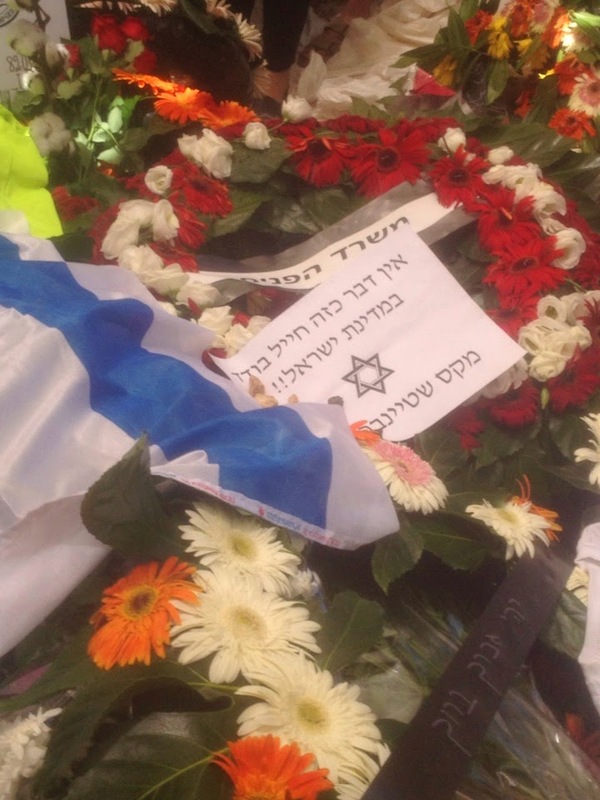 With 30,000 people attending one soldiers funeral, displaying signs saying "There is no such thing as a lone soldier in Israel", this war is only serving to make the ties between everyone here stronger. We aren't going anywhere and the quicker people get used to it and accept it the quicker they can benefit from the amazingness that is the state of Israel.